Hello Lovelies, as you may know, I am always on the lookout for the next best product. However, I am particular when it comes to the products I use on my skin. Exuviance is a brand that I have heard off and read many good things about including their glycolic peels. Therefore, I was excited when they sent me their Performance peel to test out. 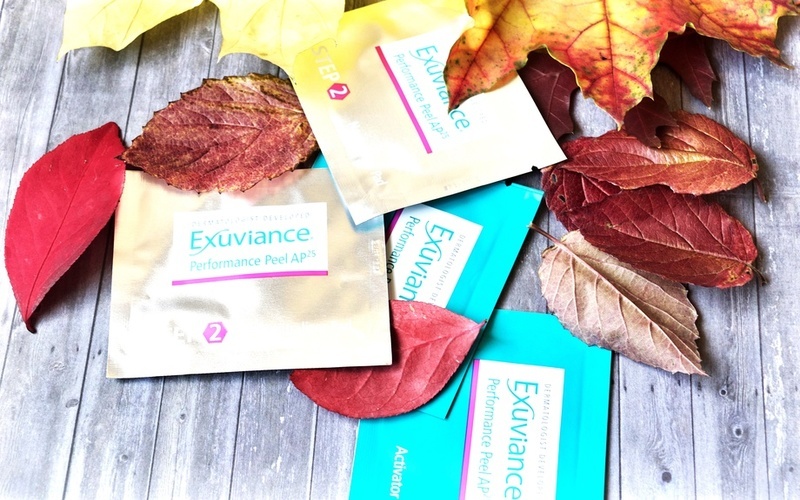 Exuviance is the original creator of the Glycolic peel; I knew I would like their Performance Peel AP25 as I have heard many good things about their glycolic peel. Their performance Peel AP25 is a safe two-step at home procedure. Some benefits of using this product are the Anti-aging and anti-wrinkle benefits. This product is a six weeks supply and contains twelve single use peels plus one sensitivity test peel. I like that these are pads; it is easy to use and mess free. When I received my peel, I immediately washed my face with my gentle cleanser, rinsed my face with cool water and pat it dry. I then proceeded to use the sensitivity test peel on a small part of my face and followed the directions I used the peel mainly the right side of my jaw and Luckily for me; everything went well, no reaction. 1. I used the STEP 1 Activator Pad all over my face avoiding the most sensitive parts such as my eyes and lip area. I then set my alarm for ten minutes and waited. As I waited, I experienced slight tingling and tightness, but that was of no concern to me as I had already done the sensitivity test. After ten minutes, I proceeded to STEP 2. 2. I applied STEP 2 Neutralizer Pad on my face and immediately rinsed my face. My face felt clean, relaxed, and refreshed like I had just had a spa treatment. 3. After washing my face, I applied one of my favorite moisturizers. I gently massaged and patted the moisturizer into my face for maximum absorption. I must admit, my face felt so fresh and renewed after I finished using the peel. Using the Performance Peel AP25 is an easy at-home peel session that is equivalent to going to the aesthetician, and plus you can totally relax with a cup of warm tea and pamper yourself, and that's what I totally did lol 😊😀😀. I use the peel twice a week. IMPORTANT: The kit comes with 13 single pads (12 single-use pads plus one sensitivity test peel.) Before using the first peel, It is recommended that you use one STEP 1 Activator Pad and one STEP 2 Neutralizer Pad on a small part of your face following the directions. If there is no Irritation or discomfort after 24 hours, you may proceed with a peel of the entire face. After a week of using this peel, I noticed smoothness and toned skin. My dark spots seem to be lightening. I am excited about this peel, and I will continue to use it twice a week. 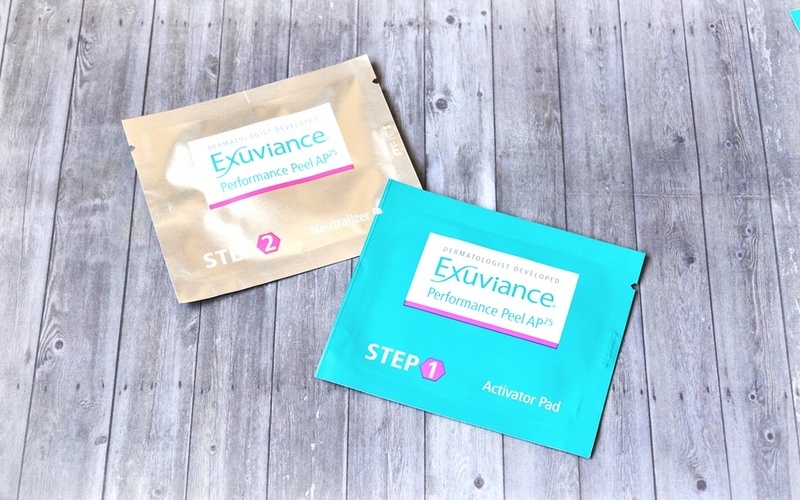 If you are looking for an easy at-home peel, I will recommend you give Exuviance Performance Peel a try. Exuviance is a high-performance peel that is safe to use at home. This skincare product is from the original creators of the glycolic acid peel. 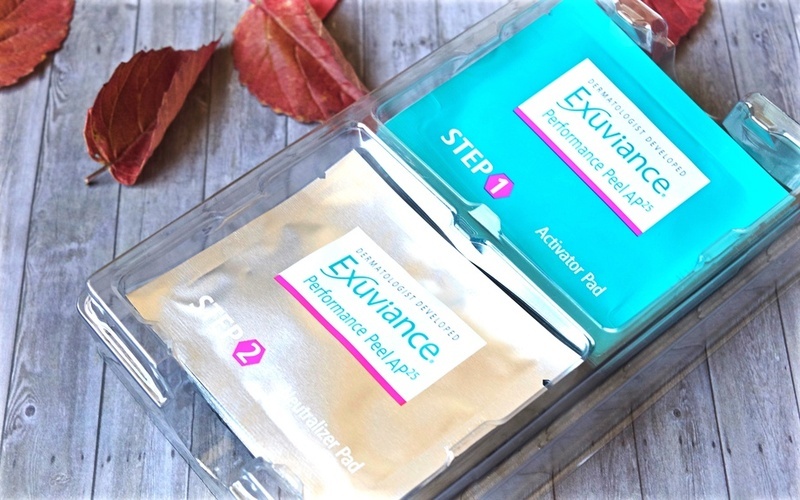 Exuviance performance Peel AP25 contains a 25% blend of Alpha Hydroxy Acids (AHAS) and Polyhydroxy Acids (PHA) including Glycolic Acid, Mandelic Acid, and Gluconolactone. 1. Refine pore size and smooth texture. 2. Visibly diminish the appearance of fine lines and wrinkles. 3. Improve clarity and brightness. 4. Brighten and evens out skin tone. 5. Provide an all-over healthy glow, suppleness, and smoothness to skin. 1. The Performance Peel contain 25% AHA/PHA blend including Glycolic Acid, Mandelic Acid, and Gluconolactone. 2. Exfoliate dead, dull surface layers. 3. Encourage the process at cell renewal to reveal healthier cells. 1. Cleanse your face with a gentle, effective cleanser. 1a. Apply a STEP 1 Activator Pad over the entire face, avoiding eye area, lips and any area that is sensitive. Carefully monitor the skin's response to the Peel by observing any redness or discomfort, including stinging burning, tightness, tingling or peeling. 2. Apply STEP 2, The Neutralizer Pad to the face after 10 minutes, or sooner if you experience bothersome redness or discomfort. Apply over entire face (avoiding eyes and lips), and then rinse the face thoroughly with water. You may leave the (STEP 1) activator solution on your skin up to, or as long as 10 minutes. You may experience some bothersome, dryness or stinging during the 10 minutes time frame the activator solution is on your face. If you experience the stinging and burning sensation, It is advisable to apply the (STEP 2) Neutralizer Solution earlier than 10 minutes, or as soon as you experience the stinging sensation if you find it bothersome. As with all Hydroxy Acid Peel, a slight tingling sensation is expected, but if this sensation is too much, it is recommended to neutralize the peel sooner than the total 10 minute time. Exuviance is created by Drs. Van Scott and Yu, widely recognized as leaders in the field of cosmetics dermatology. They discovered the anti-aging benefits of Glycolic Acid and created and patented the first Glycolic Peel since their ground-breaking discovery, the creators of Exuviance have continued to develop many new patented anti-aging ingredient backed by evidence from numerous scientific and clinical studies. Recognized around the world, Exuviance formulas are expertly designed to visibly transform skin by combining their patented innovations with the best, state of the art technologies available in dermatology today. *This post is in collaboration with Exuviance. All thoughts and opinion are my own.